It’s no secret that the Rev. Hollie Tapley is passionate about mission work. Since her first youth mission trip to La Nariz, Mexico, in 1979 to last month’s travels to Haiti, Tapley has lost count of the dozens of trips she has organized. 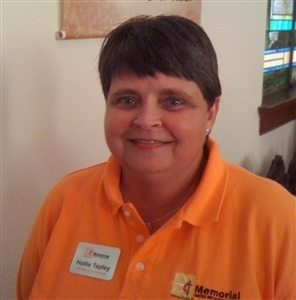 Despite intentions to limit her conference activities when she transferred from the South Georgia Conference three years ago, Tapley is spearheading efforts to make UMVIM as recognized and active as the United Methodist Women. Over the past several months, Florida’s UMVIM task force has worked to refine goals, organize resources and restructure procedures to equip, educate and empower conference members when it comes to mission trips. Whether it is a small, rural church in need of roof repairs in the United States or a large-scale earthquake recovery effort abroad, the Southeastern Jurisdiction of UMVIM maintains a database of short-term mission opportunities that have been carefully vetted. The organization also provides resources and support in the form of training, information, contacts and financial assistance to conference members who are organizing mission trips. The Revs. 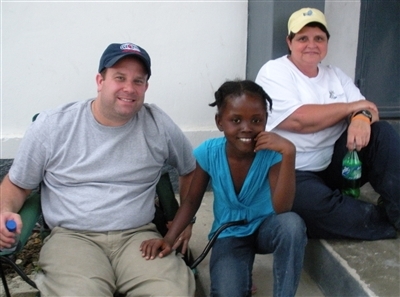 Jeff Tate (left) and Hollie Tapley visit with a girl from the village of Cabaret, Haiti, during an UMVIM trip in April. Tapley points out that in addition to empowering the trip leaders, UMVIM promotes safe and successful trips and ensures that traveling tips and best-practices knowledge is shared with subsequent mission teams through the vetting, approval and feedback process for each mission opportunity in the database. It offers affordable trip insurance and is able to respond quickly to get mission travelers to safety when the unexpected – like a bombing in Uganda or earthquake in Haiti – occurs. Tapley and Garrison also want mission trip organizers to know that UMVIM’s ability to harness funding sources – through grants and donations – can help trip participants defray the cost. Tapley and the board are hopeful that more Florida conference members will experience the benefits of an UMVIM mission trip now that the barriers of lack of information, experience and/or finances are being chipped away. To support UMVIM, checks may be made out to the Florida Annual Conference Treasurer, noting Conference Advance Special #100180, and sent to Pam Garrison’s attention at the Florida United Methodist Center, 450 Martin Luther King Jr. Ave., Lakeland, FL, 33815. For information on upcoming trainings, please visit www.flumc.org/umvim.